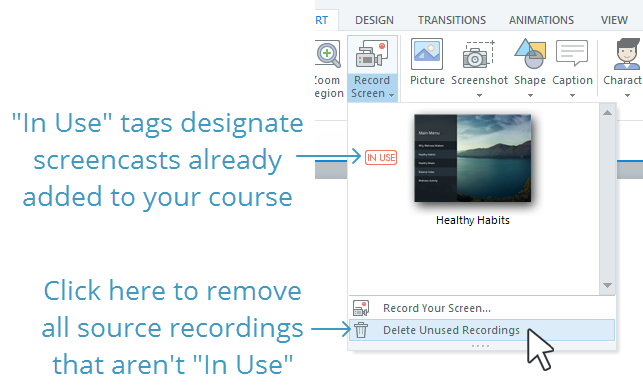 You can delete screencast slides from a course or delete the source recordings from the project file altogether. To delete a screencast you've already added to your course, just select the slide(s) where it appears and press the Delete key on your keyboard. Deleting screencast slides doesn't remove the source recording from your project file. That means you can insert it into your course again later if you change your mind. To remove the source recording for a specific screencast from your project file, go to the Home tab on the ribbon, click the Record Screen drop-down arrow, and select the screencast you want to delete. 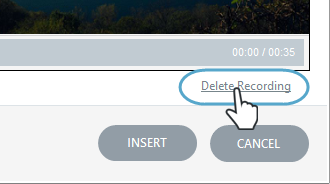 When the screencast preview window opens, click the Delete Recording option in the lower right corner, then click Cancel to close the window. Tip: Source recordings can't be deleted while they're being used on slides in your course. Storyline adds helpful tags to let you know which screencasts are In Use.